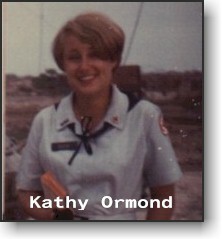 Kathy Ormond, now residing in Lisbon, Iowa was assigned to the 11th ACR from July of 1968 until October of that year. She also was assigned to the 1st Infantry Division at Lai Khe. She has submitted these photos. Kathy outside the CP in the forward area near Bien Hoa. Kathy exiting a truck at Blackhorse base camp. Club Mobile Unit - Blackhorse base camp. Ruth Darden and Kathy Ormond stand by 2nd Sq. HQ sign.